Doctrine cards are a new category of upgrade cards that focus on national characteristics, rather than equipment or training, and let us elaborate on how different nationalities fought and provide some new play styles within those nationalities. 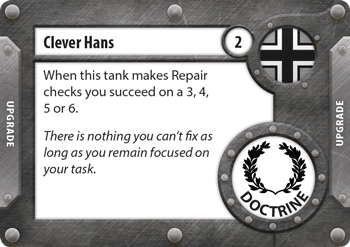 This week we will look at two of the new Doctrine cards: “Clever Hans” and “No Retreat”. This card keeps the German tanks going. Being able to shrug off lasting critical hit damage cards easier means you can take more risks. Being able to stack this card with some of the re-roll upgrades means if there is any type of Damage cards you hate to get you can almost guarantee its removal, I’m looking at you “Bailed Out”. This card is interesting, it can give you multiple re-rolls in one round. No Retreat gives you a great defensive boost and a good attack boost, at a cost. This Doctrine cannot be used with the Soviet “Coordinated Fire” rule. No Retreat opens up a new playstyle for the Soviet platoons that will allow soviet players to be more flexible on the field. Doctrine cards gives players some new and interesting choices. Some cards may focus on particular tanks while others will have a more universal use. 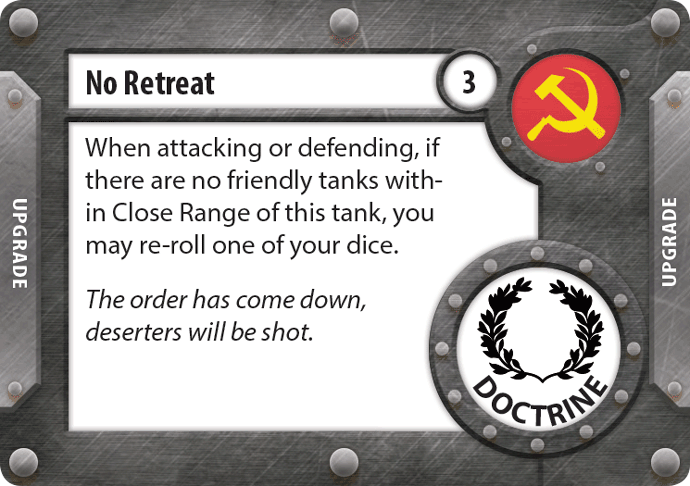 But since each tank can only have one Doctrine card at a time, players will have to make some hard decisions when it comes to choosing which Doctrine cards to use.